Sainted Tykhon, Bishop of Amaphuntum, was born in the city Amaphuntum on the island of Cyprus. His parents raised their son in Christian piety, and taught him the reading of Sacred books. There is an account extant, that the gift of wonderworking appeared in Saint Tykhon at a still quite youthful age. His father was the owner of a bread bakery and he sent his son to distribute bread. The holy lad gave bread free to the needy. Learning about this, his father became angry, but the son answered, that he had read in the holy books, that "in giving to God one receiveth back an hundredfold". "I too, – said the youth, – gave to God the bread which was taken" and he persuaded his father to go to where the grain was stored. With astonishment the father saw that the granary which formerly was empty, was now filled to overflowing with wheat. From that time the father did not hinder his son from distributing bread to the needy. A certain gardener brought from the vineyard the dried prunings of vines. Saint Tykhon gathered them, planted them in his garden and besought the Lord, that these branches might take root and yield salubrious fruit for the health of people. The Lord did so through the faith of the holy youth. The branches took root, and their fruit had a particular and very pleasant taste and was used during the lifetime of the saint and after his death for the wine in making the mystery of the Holy Eucharist. They accepted the pious youth into the church clergy, made him a reader, and afterwards the bishop of Amaphuntum Memnon ordained him to the dignity of deacon. 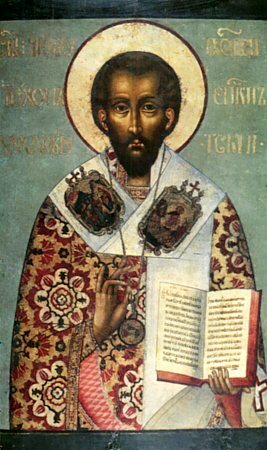 After the death of Bishop Memnon, Saint Tykhon by universal agreement was chosen as bishop of Amaphuntum. The ordination was headed by Sainted Epiphanios, Bishop of Cyprus (+ 403, Comm. 12 May). Saint Tykhon laboured zealously for the eradication of the remnants of paganism on Cyprus – he destroyed an idolatrous temple and spread the Christian faith. The sainted-bishop was generous, his doors were open to all, and with love he listened to and fulfilled the request of each person who came to him. Fearing neither threats nor tortures, he firmly and fearlessly confessed his faith before pagans. In the service to Sainted Tykhon it is pointed out, that he foresaw the time of his death, which occurred in the year 425. The name of Sainted Tykhon of Amaphuntum was accorded great honour in Russia. In honour of the saint, temples were constructed at Moscow, at Nizhni Novgorod, at Kazan and other cities. But the saint was particularly venerated in Voronezh diocese, where there were three archpastors in succession sharing the name with the Sainted-bishop of Amaphuntum: Sainted Tikhon I (Sokolov) (+ 1783, Comm. 13 August), Tikhon II (Yakubovsky, until 1785) and Tikhon III (Malinin, until 1788).